Studs Terkel was an American icon who had no use for America's cult of celebrity. He was a leftist who valued human beings over political dogma. In scores of books and thousands of radio and television broadcasts, Studs paid attention - and respect - to "ordinary" human beings of all classes and colors, as they talked about their lives as workers, dreamers, survivors. Alan Wieder's Studs Terkel: Politics, Culture, But Mostly Conversation is the first comprehensive book about this man. Drawing from over one hundred interviews of people who knew and worked with Studs, Alan Wieder creates a multi-dimensional portrait of a run-of-the-mill guy from Chicago who, in public life, became an acclaimed author and raconteur, while managing, in his private life, to remain a mensch. We see Studs, the eminent oral historian, the inveterate and selfless supporter of radical causes, especially civil rights. We see the actor, the writer, the radio host, the jazz lover, whose early work in television earned him a notorious place on the McCarthy blacklist. We also see Studs the family man and devoted husband to his adored wife, Ida. 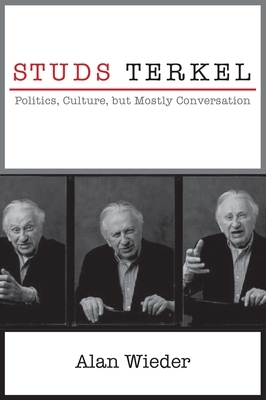 Studs Terkel: Politics, Culture, But Mostly Conversation allows us to realize the importance of reaching through our own daily realities - increasingly clogged with disembodied, impersonal interaction - to find value in actual face-time with real humans. Wieder's book also shows us why such contact might be crucial to those of us in movements rising up against global tyranny and injustice. The book is simply the best introduction available to this remarkable man. Reading it will lead people to Terkel's enormous body of work, with benefits they will cherish throughout their lives.